The Polaroid iSO85 is a waterproof, shockproof, floating camera with a tough outer exterior, but that's about the extent of what it does well. Lacking advanced features and some very common conveniences (e.g. rechargeable batteries), the iSO85 a simple point-and-shoot designed for accident-prone users and younger photographers. There's not much to redeem the iSO85 except for its low price and sturdiness. The camera is designed for simple needs and works well enough when exposed to the bumps and scrapes of daily life. Anything more advanced than that, and you'll essentially be left with a toy. As one of the cheapest waterproof cameras available, the iSO85 does a lot to sacrifice performance in pursuit of the bottom line. The iSO85 is lightweight and compact, but has a hard plastic exterior that offers little grip. The camera has basic controls for taking pictures, zooming in and out, and navigating the menu. An interesting feature of this camera is its two LCD screens - one on the front and a larger one on the back. The rear LCD has a series of buttons for navigating through pictures and changing settings. The iSO85 takes images that are good enough for the price. The 16 MP camera takes high resolution videos that often appear grainy or blurry, even with the camera's built-in image stabilizer. The camera features a flash that helps somewhat in low-light conditions, but only works up to a maximum of 2 meters. The camera records basic video without any additional features or functionality. Battery life in the iSO85 ranges from 1 - 2 hours depending on use. The camera uses two AAA batteries - unusual in this day and age - and is surprisingly power-hungry considering its size. You'll feel like you're back in the nineties, lugging around packs of batteries just to get a single day's worth of photos. The iSO85 is also rather slow, taking several seconds just to turn on and snap a picture. The iSO85 lacks any advanced shooting modes, settings, control over balance or exposure, or even a timer. 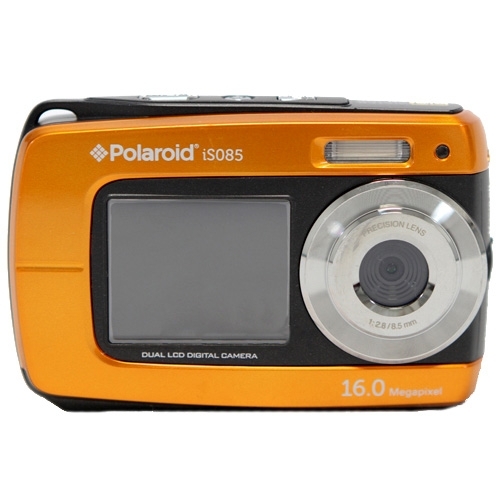 Polaroid's aimed for ease-of-use, foregoing any add-ons or accessories in favor of a super simple interface. The camera seems to have been designed for water, with its added buoyancy making it ideal for the pool or beach-side. The iSO85 is a budget camera through and through, and it shows. Polaroid's designed a camera that's been super-simplified and accident proofed. To put it another way, the iSO85 is a camera for kids. Younger photographers will find no fault with this camera, and parents will appreciate the price. For everyone else, you can find a better camera elsewhere.